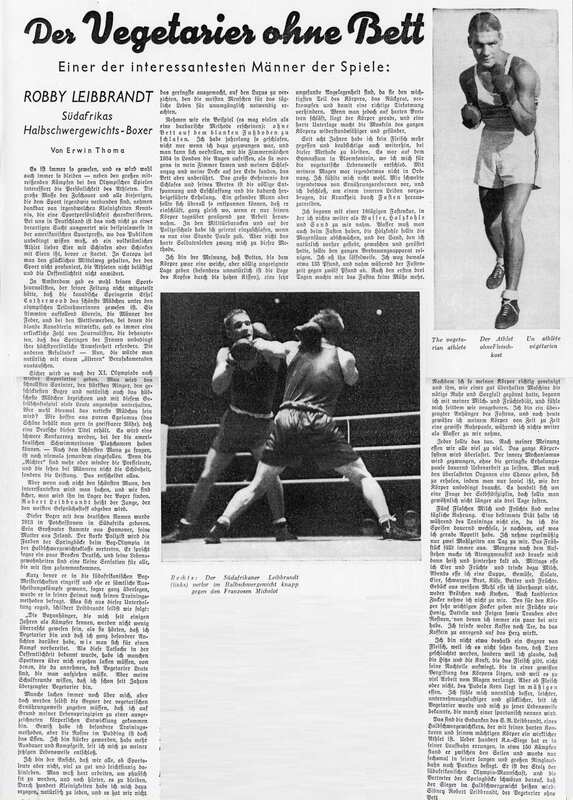 Sidney Robey Leibbrandt (born on the 25 Jan.1913 in Potchefstroom/South Africa) of German descent was the South African Heavy Weight Champion, and represented South Africa at the 1934 Empire Games. 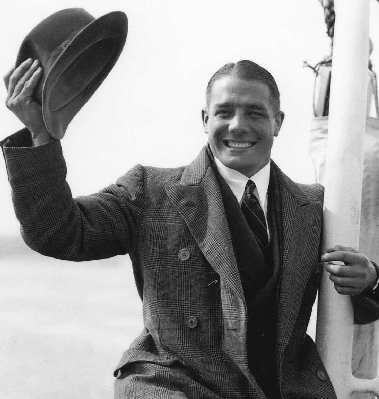 With the S.A Olympic Team in 1936, Robey went to Germany, where he was impressed with Nazi Germany and as fascinated with Hitler. He returned to Berlin in 1938 to study at the Reich Academy for Gymnastics, and stayed on when war broke out. With help of the German Army he qualified as a glider pilot, and was awarded his paratrooper wings after completing the course. The German counterespionage (Abwehr II) under Admiral Canaris ordered to implement Operation Weissdorn, a plan to overthrow the Smuts regime and to bring about a coup d'etat in South Africa with Ossewa Brandwag support. The political elimination of General Smuts was to act as a catalyst to unite the country against the pro-war party.Robey Leibbrandt under the code name of Walter Kempf, was instructed to return to S.A. on the yacht Kyloe. June 1941 Robey was put ashore at Mitchells Bay/South Africa. After various adventures, he met Dr van Rensburg, the O.B. leader. Van Rensburg was unsympathetic to Leibbrandt's overtures. Leibbrandt continued in his attempts to drum up support, winning converts to his cause with fiery speeches at meetings in the Oranje Free State. and the Transvaal. These converts took the Blood Oath, and trained in time bomb making sabotage. After a confrontation with the police who had been given a tip by the leadership of the O.B. - off Robey evaded capture. A reward of R1000 was offered for his capture, dead or alive. Then a member of his own group betrayed Robey´s trust and the net was beginning to close. On the 21 December, a report in the Rand Daily Mail read, "Leibbraindt Group Smashed." So the 'Operation Weissdorn` was cancelled. Robey Leibbrandt's political high treason trial began on 16th November 1942 and he was condemned to death. On 11th March1943 his death sentence was commuted to life imprisonment by General Smuts who had admired Leibbrandt's father as a "courageous Boer warrior" in the Anglo Boer War. After the Nationalist Party won the General Election in May l948, Robey and all other political prisoners were pardoned and released. He later married and had five children. Robey Leibbrandt died on 1 August 1966 in Ladybrand. Alexander, G. 1976. So ging Deutschland in die Falle. Wien: Econ: 237. Beyers, C.J. s.a. Dictionary of South African Biographie, IV. Butterworth: 306-8. Beyers, C.J. s.a. Suid-Afrikaanse biografiese woordeboek. Butterworth: 322-3. Bresler, C.P. 1965. Tilt the Sack. Pretoria: Van der Walt & Son: 129-139. Brockdorff, W. 1967. Geheimkommandos des Zweiten Weltkrieges. München: Welsermühl: 156-67. Cigaretten-Bilderdienst. Hrsg. s.a. Die Olympischen Spiele,Bd.2. Hamburg:104. Crwys-Williams, J. A 1992. Country at War 1935-1945.Rivonia: Ashanti: 200-2, 325-7. Du Preez, M. 2004. Of warriors, lovers and prophets. Cape Town: Zebra Press: 167-84, 234. Fritz,B. & Kritzinger,L. 1999. Eeugenoot. Kaapstad: Huisgenoot: 66-68. Furlong, P. J. 1991. Between Crown and Swastica. Hanover: University Press: 135, 145-7, 245. Hagemann, A. 1989. Südafrika und das Dritte Reich. Frankfurt/M. : Campus: 303-308. Hart-Davis, D. s.a. Hitler´s Games. New York: Harper & Row: 222. Joyce, P. 2000. Suid-Afrika in die 20ste eeu. Kaapstad:Struik: 99. Joyce, P. s.a. The South African Family Encyclopaedia. Cape Town: Struik: 206. Kurowski, F. 2003. Deutsche Kommandotrupps 1939-1945 Bd.II. Stuttgart: Motorbuch:332-8. Lawrence J. 1972. Harry Lawrence. London: Gentry Books: 132, 137-40, 222. Leigh, M. 1992. Captives Courangeous. Johannesburg: Ashanti: 208. Leppan, J.D. 1983. Suid-Afrikaanse Polisie. 54-55. Mader, J. 1971. Hitlers Spionagegenerale sagen aus. Berlin: Verlag der Nation: 349,155-6, 366, 389. Malan, M.P.A. 1964. Die Nasionale Party van Suid-Afrika. Elsierivier: Nasionale Handelsdrukkery: 234. Marx, C. 1998. Im Zeichen des Ochsenwagens. Münster: Lit Verlag: 393-9. Mandela, N. 2004. Long Walk to Freedom.London: Abacus: 129, 574. McMahon,P.J.& Robinson,D.L.1988. Suid-Afrikaanse geskiedenis.St.10.Pretoria:Haum: 56. Peis, G. 1976. Spiegel der Täuschungen. München: Heine: 207-8. Peis, G. 1976. The Mirror of Deception. Newe York: Simon & Schuster: 128, 197. Quass, F.W. s.a. En nou, die lente? Johannesburg: Afcet-uitgewers (EDMS). Russel, F. 1982. The Secret War. Chicago: Time Life: 46-7. Saint-Loup. 1957. Les voiliers fantômes d`Hitler. Paris: Presse de la Citê 57-122. Saint-Loup. 1975. Die Geisterschiffe Hitlers. Bielefeld: Delius, Klasing & Co: 67-130. Saint-Loup. 1988. Yachten in geheimer Mission. Bielefeld: Delius, Klasing & Co: 67-130. Sampson, A. 199.Mandela The Authorised Biography. London: Harper Collins Publisher:105, 221. Sonderling, N.E. 1999. South Africa Biographie, II. Pretoria: Vista University: 306-8. Uys, I. 1992. South African Military, Who`s Who 1452-1992. Germiston: Fortress: 131. Central News Agtency LTD: 160, 209-212. Van Rensburg, H. 1964. Der weiße Sündenbock .Göttingen: Schütz: 171-6. Visser, G.C. 1976. O B Traitors or Patriots? Cape Town: Cape and Transvaal Printers. Walkler, E.A. 1959. A History of Southern Africa. London: Longman: 716. West, R. 1989. The Diamonds and the Necklace. London: Hodder & Stoughton: 163-8, 169, 171-2. Wighton, C. & Peis, G. 1958. Hitler´s Spys ans Saboteurs. New York: Henry Holt and Co.: 83-123. Wighton, C. & Peis, G. 1958. They Spied on England. London: Odhams Press: 154-95. Wighton, C. & Peis, G. 1965. Les spions de Hitler. Fayard: Librairie Arthème: 87-128.